* Application of these techniques to large-scale CFD analysis anddesign. This book should prove equally valuable for CFD developers,practitioners and graduate students. 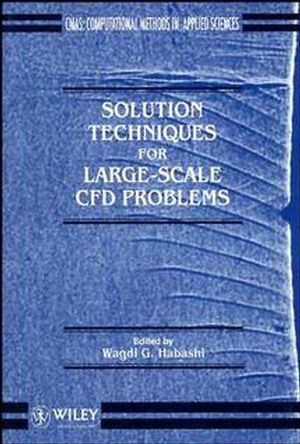 Wagdi G. Habashi is the author of Solution Techniques for Large-scale CFD Problems, published by Wiley. CFD ALGORITHMS FOR PARALLEL AND VIRTUAL-PARALLELARCHITECTURES. Solving Large Incompressible Time-Dependent Flow Problems onScalable Parallel Systems (H. Daniels & A. Peters). CFD ALGORITHMS FOR VECTOR-PARALLEL AND MPP ARCHITECTURES. Compressible Navier-Stokes Solvers on MPPs (L. Fezoui, etal.). CONVERGENCE ENHANCEMENT TECHNIQUES 1: PRECONDITIONED ITERATIVESOLVERS FOR IMPLICIT AND FULLY-COUPLED METHODS. The Algebraic Multilevel Iteration Method: A Scalable and OptimalAlgorithm (O. Axelsson). Quasi-Minimal Residual Iterative Solvers for CFD (N. Nachtigal& B. Semeraro). CONVERGENCE ENHANCEMENT TECHNQIUES II: DEFECT CORRECTION,MULTIGRID, FORMULATION PRECONDITIONING AND ZONAL METHODS. Multigrid Methods for Turbomachinery Navier-Stokes Calculations (A.Arnone). APPLICATION TO LARGE-SCALE SIMULATION AND DESIGN INAEROSPACE. Unstructured Mesh Methods for Aerospace Applications (K. Morgan, etal. ).